Riverdi is a company that is solely concentrated on the development and creation of high quality TFT modules, utilising optimal parts from both the European and Asian markets. Collaborating with display manufacturers in China and Taiwan, the complete modules are then assembled in Europe. This allows Riverdi to offer high quality products that can be delivered quickly and still retain competitive pricing in comparison to its associate distributors. The company has invested in new technology from FTDI Chip with its Embedded Video Engine (EVE) series, the FT8xx range of graphics controller ICs, to power its wide range of intelligent TFT modules. For each resolution, there are three options with regard to touch screen type. When an application is being created whereby the end user does not need to input any information, the best choice is the version without a touch screen, which makes the project more cost-efficient. In an environment where the end user would use gloves or requires a hard wearing solution (i.e., in an industrial environment) the best choice would be resistive touch. If the engineer is creating an application which requires multi touch (up to 5 points simultaneously) or the project has specific aesthetic demands, the capacitive touch panel should be selected. 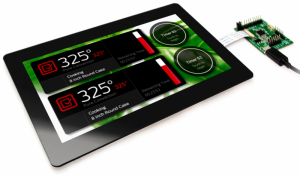 Riverdi offers a TFT module with PCT (Projected Capacitive Touch), which uses decorative glass in its default version, uxTouch. Additionally, there is an option to customize the cover glass even further when required. The TFT module evades the need for complicated drivers by utilising the FT8xx graphics controller IC. All that is needed is the proper calibration to allow direct touch coordination from the IC chip register. All Riverdi’s modules use a FFC 20-pin connector, and feature built-in LED inverters. Communication is made possible via SPI / I²C interface for those utilising the first generation EVE (FT80x) and SPI/QSPI for the use of second generation EVE (FT81x). Input voltage levels of 3.3V make it possible to use the same FFC for supplying the power and communication to the module. The displays work in a wide temperature range – 20°C to 70°C – and have 70/50/70/70 vison angles. Fast and easy mounting to customers own housing is possible using just four screws. Riverdi supply ready to use development platforms for utilizing in users own projects. A Hermes board creates the USB connection for the TFT module to work with a PC class controller. 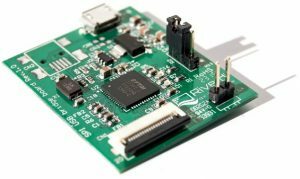 Based on FTDI Chip’s FT232HQ, USB can be converted to SPI for fast testing and prototyping applications, without the requirement of any additional hardware. Utilising an Arduino Shield means that a standard board will work directly with the TFT module, allowing the creation of applications in the Arduino IDE. For standalone microcontroller set up, the Riverdi Revelation Board based on the STM32F0 MCU can be used, allowing the engineer to create a project with an optimal structure directly on the ARM processor. The FT8xx series of display controllers are designed to offer access to high quality colour display solutions for a wide range of applications. The devices offer 3 functions – visual display creation (up to 800 x 600 pixel resolution), touch control (resistive or capacitive) and an audio output ideal for providing clicks and beeps in response to human interaction with the devices. 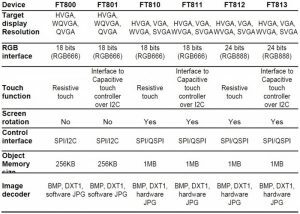 As an SPI peripheral to a system MCU, the heavy processing tasks for creating a visual display or calculating a touch point is handled efficiently by the FT8xx, allowing Riverdi displays to be paired with a wide variety of embedded processors: ARM, PIC, Arduino and many more. The devices simplify construction of display data through the placing of objects on a display list including the most basic elements when conducting a list: what to draw, where to draw and the size and colour of each object. It is then processed by the FT8xx for driving the display line by line, with no frame grabbing required. Additional algorithms such as alpha blending and anti-aliasing all help to improve the image quality, while the FT812 and FT813 variants found within the FT81x second generation EVE range offer true 24 bit colour depth. 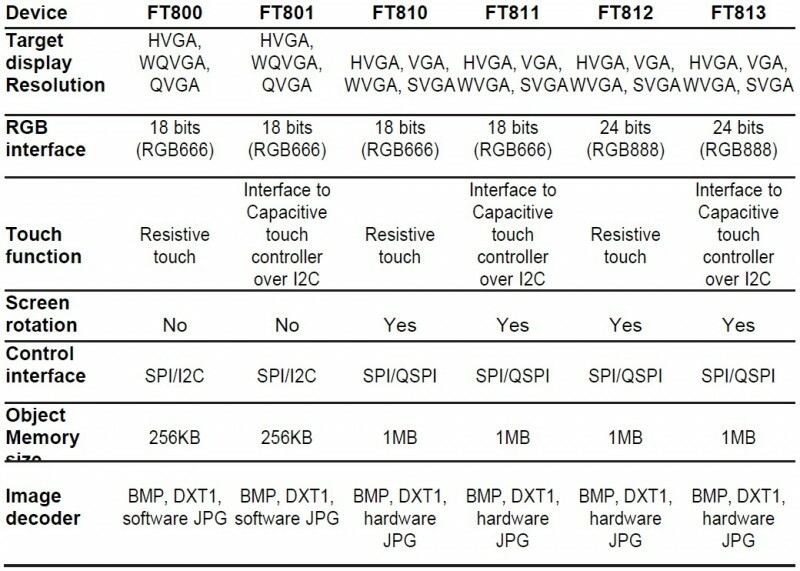 As all items displayed are treated as individual objects, the FT8xx devices are also able to simplify coding of touch events by ensuring each object returns a unique ”tag” value if a touch point is detected within the area of the object. This simplifies an end users application code as there is no need to calculate whether a touched point is within a specific display area or not. While the FT80x variants are best suited to menu style displays or simple animations, the FT81x variants enhance this capability by adding video playback and the ability to rotate a display, thus ensuring that the Riverdi solution will work well in both portrait or landscape designs. Riverdi is among the first manufactures to take advantage of the ground breaking technologies found within the EVE display controller series, and is proud to have created the first complete module utilising the FT81x. By specializing in the creation of premium TFT modules, and providing high quality, ready to use solutions, the benefits of EVE technology from FTDI Chip is realised. Additionally, Riverdi is pleased to be able to strengthen its offering with a wide range of development tools to assist in the development of new project in the chosen IDE. Riverdi is an innovative company which uses cutting-edge technologies to provide solutions which meet today’s end user demands. Within its first few years on the market, the company developed its’s own process of TFT module production in Shenzhen and Poland, allowing for guaranteed high quality and cost efficiency. All of Riverdi’s products use industrial grade materials and components, thus they can be used in both consumer and industrial projects. Riverdi guarantee that each and every product has been produced and shipped in line with its maintained quality procedures. Riverdi keeps a permanent stock of basic products, and are thus able to offer a competitive delivery time of a few days as maximum. For more information please visit www.riverdi.com. FTDI Chip develops innovative silicon solutions that enhance interaction with today’s technology. To meet its ‘USB Solutions Specialist’ status, the company works to support engineers with highly sophisticated, feature-rich, robust and simple-to-use product platforms. 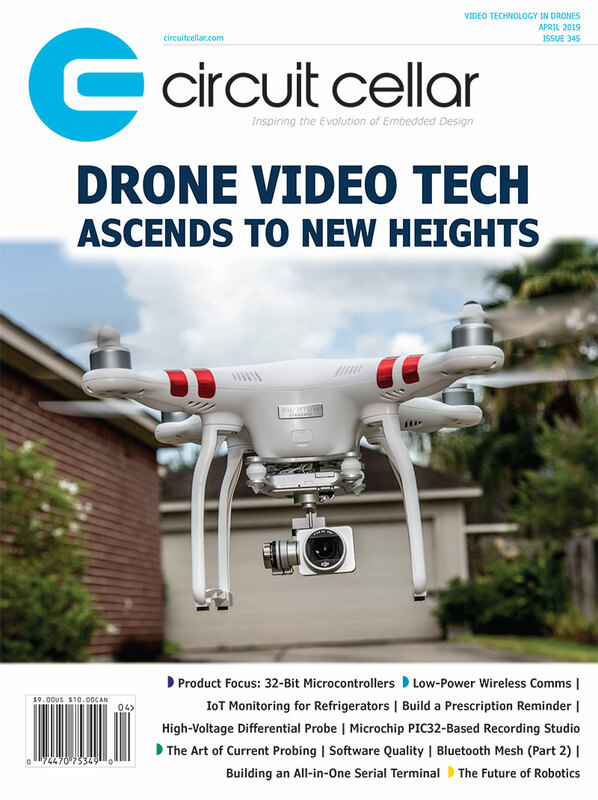 These enable creation of electronic designs with higher performance, fewer peripheral components, lower power budgets and diminished board real estate. FTDI Chip’s long-established, continuously expanding Universal Serial Bus (USB) product line boasts such universally recognised product brands as the ubiquitous R-Chip, X-Chip, Vinculum and H Series. FTDI Chip is a fab-less semiconductor company partnered with the world’s leading foundries. The company is headquartered in Glasgow, UK with research and development facilities located in Glasgow, Singapore and Taipei (Taiwan) plus regional sales and technical support sites in Glasgow, Taipei, Portland (Oregon, USA) and Shanghair (China).For more information please visit www.ftdichip.com. This entry was posted in Sponsored and tagged EVE Touch Controller, FT8xx, FTDI, intelligent display, Riverdi by Circuit Cellar Staff.